All browser-based. No installation, ready to use. 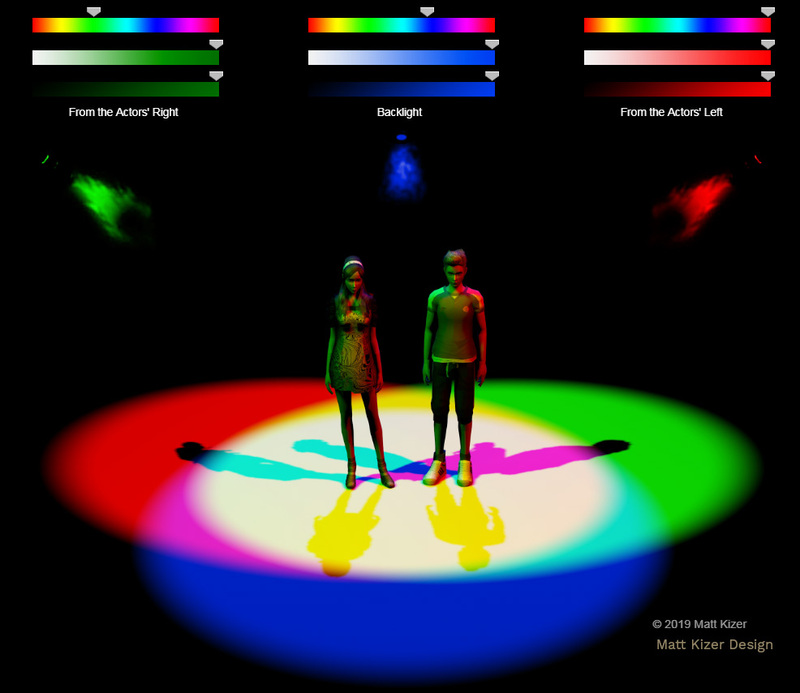 The Color Lab is an online virtual space to experiment with colored light on the human body and on a white floor. Three instruments intersect from three directions with complete control of brightness and color. This is a an excellent tool for classroom demonstration or simple demonstration of lighting hues and mixing. Tested on Chrome, Firefox, Safari, Opera, & Edge. 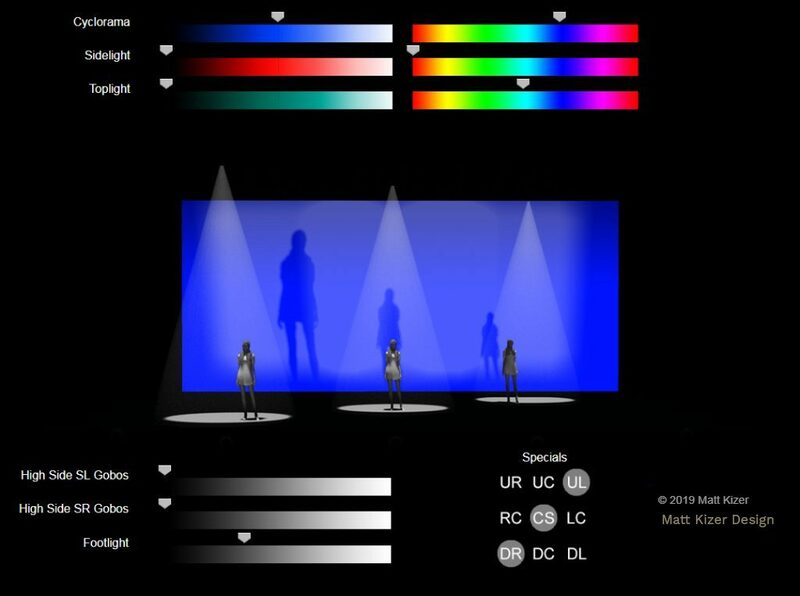 Create lighting for dance on a digital proscenium stage. Top light, side light, gobos, footlights, and more. Complete control of color and brightness. Tested on Chrome, Firefox, Safari, Opera, & Edge. 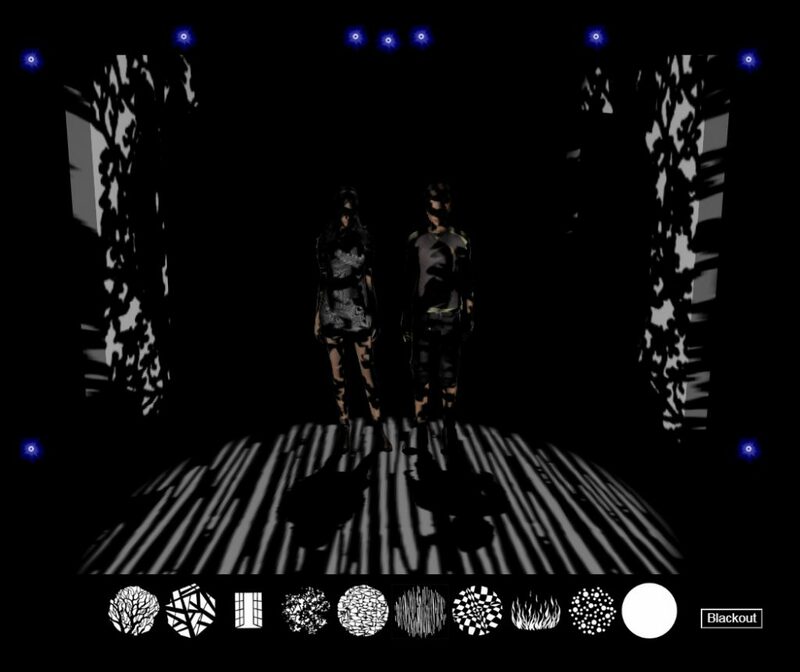 The Gobo Lab is a browser-based virtual light lab. It lets you experiment with gobos and textures and lighting direction. There are nine different lighting positions available. Each can hold one of ten different gobo templates. Each can be set at a different brightness. Two actors stand on a small stage surrounded by simple scenery. This is an excellent tool for demonstrating the principles of direction and texture for light either for an individual, or in a classroom. Test on Safari, Chrome, Firefox, and Opera. Sorry, it will not run on Internet Edge/Explorer. Prepare yourself  for THE DRAMA MACHINE. 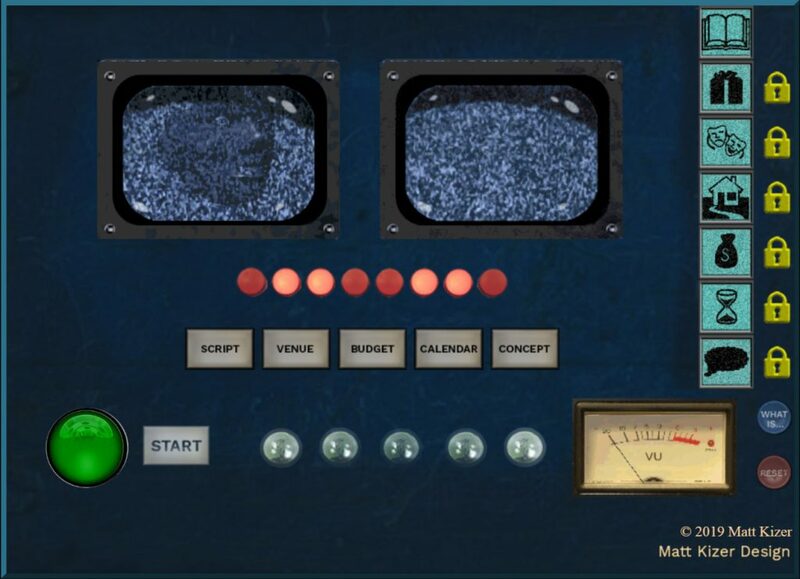 This is an interactive application that randomly combines the variables that we deal with in production: Script, Director’s Concept, Venue, Budget, and Time. It churns out the circumstances for a hypothetical production with gaudy special effects and noises. Have students come up to the machine, one at a time, and generate a new set of circumstances. This turns your class into a game show for the day, and inspires extraordinary discussion about how designing is always problem solving.In my classroom, we use this on a Smart Board. Students come up to the machine in turns and create a new set of circumstances. Embarrassing goggles or eye-ware are especially helpful for anyone operating the machine. This machine makes some great noises, so TURN UP YOUR SOUND! ;)If you do not have a smart board, you can still use this. It could be used with a projector or other type of screen. I would suggest coming up with some way to make a big deal out of pushing the next button each time. Maybe a drum-roll. Students can operate this on their own, either in class, or as an assignment. We like to think we all just want the show to be the best it can be, but we all bring our own character traits and flaws into the process. How do you train artists to look past their internal agendas and work together for the good of the show? And if not, how do you just have a lot of fun along the way? With PRODUCTION BEATING, students role-play a production meeting. Assign the jobs – director, set designer, lighting designer, costume designer, stage manager, technical director, sound designer, even a dramaturg. You only need a few of these to have a meeting! 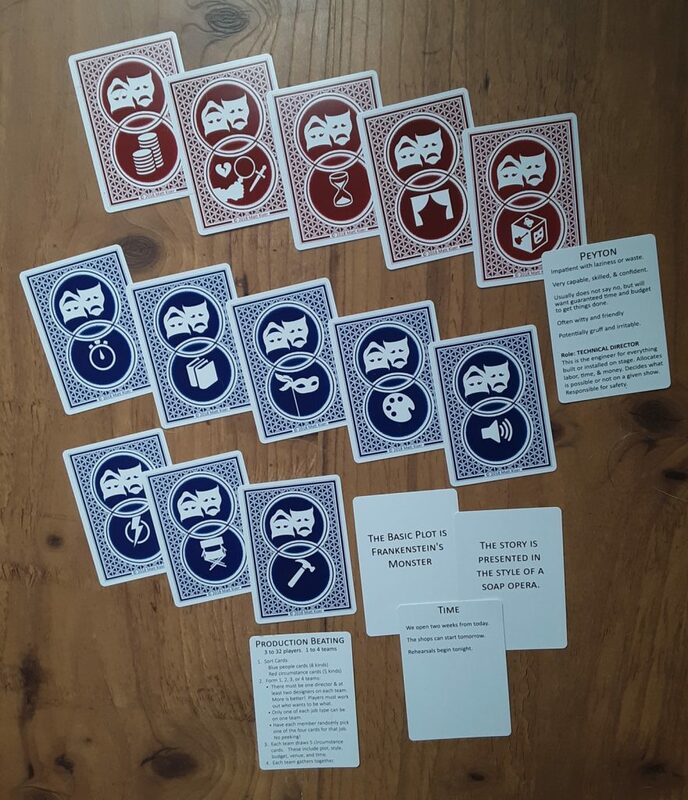 The blue cards are people and personalities. Each person then receives a random personality and name. Everyone must stay in character, without telling anyone else what their special personality quirks are. The red cards are circumstances. Once everyone has a job and a character, you deal out the production variables. Plot, time, budget, venue, and production style are provided by the luck of the draw.